While critics have decried antiglobalization as an aimless—and endless—assortment of causes, the fight for fair labor is arguably the movement’s greatest success. The industrial sweatshop has become a byword for corporate-led globalization; the world’s lowest-paying jobs have been the subject of high-profile media coverage; and exposés of sweatshop conditions have become a staple of investigative reporting and public attention. As a result, fair labor standards are now on the negotiating table of world trade agreements. 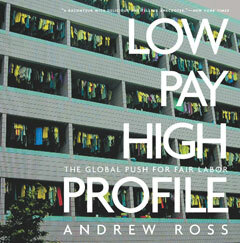 Although the fight is far from over, in Low Pay, High Profile, Andrew Ross presents case studies from around the world—from the health hazards faced by Asian microchip workers and recyclers of electronic waste to the controversy over Nike’s contract with Manchester United, the world’s leading soccer club—to show how and why the movement found the strength and energy to shake the confidence of corporate and financial elites. Here is an unabashedly partisan inquiry into the cruelty and indignity of the modern workplace that shows how critique combined with action can bring world-changing results.